Become the technical guru everyone loves. How do I copy music to my iPad or iPhone from a CD or memory card? Disclaimer: This site occasionally uses affiliate links that earn me a small referral fee at no additional cost to you. Starting a blog or website? Insert the memory card into your media slot, or your music CD in your CD drive and wait while Windows recognizes the CD and asks you what action you'd like to perform. Select "Import songs using iTunes" and click OK to start the import. Windows will automatically open iTunes and start the import, converting each music track into an mp3 file along the way. If the import does not start after iTunes opens up, then click the "Import CD" icon in the top right of your iTunes screen. The import will take a few minutes, depending on the speed of your CD drive, and iTunes will show you the progress for each music track. When the import is finished, you'll see green checks next to each music track in iTunes. Now that your music has been imported into iTunes, you're ready to copy the mp3 music files to your iPod. Plug in your iPod to your computer and wait a few seconds while iTunes recognizes it. You'll see your iPod show up on the left-hand side of your iTunes screen. Click "Library" in iTunes and select your newly imported music tracks. You can press the Shift key while clicking each track with your mouse, until they're all hightlighted. You can drag them over to your iPod, on the left side of your iTunes window. Or you can select Copy from the Edit menu, click on your iPod and select Paste from the Edit menu. iTunes will copy your selected music tracks over to your iPod. Once the transfer has completed, just right-click on your iPod and select "Eject" from the shortcut menu. Unplug your iPod from your computer, and enjoy your new music. 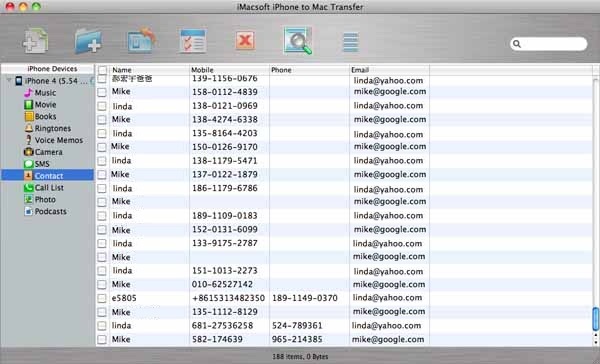 You can also upload your photos, videos and contacts by using a software program like iMacSoft (which also lets you copy text messages from your iPhone to your computer). iMacSoft loads your iPhone as if it were an external hard drive, and gives you tools for managing literally everything on your iPhone. It comes in versions for both Mac and Windows. 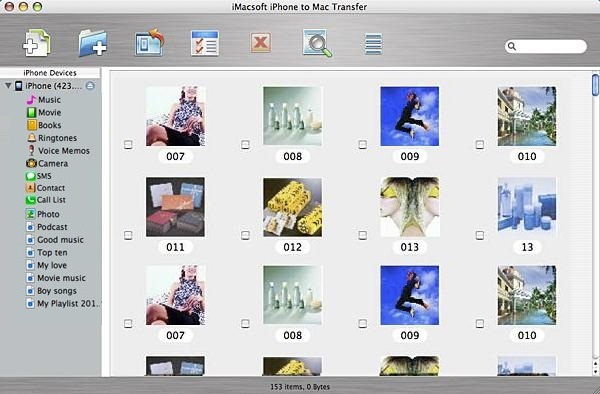 Take a look at the menu on the left side of each screenshot to get an idea of all the types of files iMacSoft can transfer between your iPhone and your Mac. It let's you transfer in either direction too, so you can upload songs and photos from your Mac to your iPhone, or download from your iPhone to your Mac. If you're looking for a comprehensive tool for managing your iPhone files including photos and contacts, then iMacSoft is worth downloading and taking for a spin. I just bought a used ipod from a friend of a friend,,,etc. All I got was the ipod, no instructions, how do I get rid of the last owners name and etc.? First go to settings then go to general click on about and it should say name and click it and type your name. I hope this helped you alot. Your directions are very easy to understand... But problem is when I put the CD in my CD Drive... I do not have the option "Import Songs using ITunes".. What now??? Assuming you have iTunes installed, you can just skip that step and open iTunes directly. Then select the CD, which will show up on the left side of iTunes, and click the "Import CD" button at the top right of iTunes (shown in the second screen shot above). when i do plug in my ipod itunes does not recognized it wat should i do now?! Please help! do you have to have itunes installed to import music? You don't have to have iTunes installed to import music from a CD to your computer (you can use Windows Media Player), but you do need iTunes if you want to transfer that music to your iPod. How do I transfer my tunes on Windows Media Player to my Ipod? Thanks ssooo much. Im thinking about getting an iPod and I have been wandering if you could put music on your iPod from a CD. Thanks a lot! If I copy song from a CD to my Ipod and then I decide to copy onother CD from the same artist will my previous song that I copy before from that artist will they be deleted from my Ipod? No, iTunes will store the other songs under a different Album name, so you can have multiple albums from the same artist. That's a frustrating limitation of iTunes, which is why I wrote this article titled How To Copy Music From Your iPod To Your PC that explains how to do this using a program called iPod 2 iTunes, which is what I use to do this. Connect your ipod to your computer. When the ipod icon appears in the itunes window (under devices) select it. If the summary pane is not showing, click the summary tab. Click Music (below Library, on the left side of the itunes window) and then drag songs and playlists to your ipod. Hey man, my problem is when i put my cds in, my laptop doesnt read it. how can i copy my song from library to my ipod? Check out this article (there's a section on copying music from your itunes library to your ipod that should help). Can the name be changed on the ipod? It's my daughter but when I started using it I put in my instead of hers. Hey Ricky I have a quick question how can I put the same artwork in a ipod I have a classic 160 gb and I have like 5 cds of tupac but you know on the ipod you can arrange the album well I want to just put the same album artwork by the same particular artist regartless of how many different albums they have that way I won't have different albums by the same artist thanks for the help. thanks. i've been so used to buying songs that i forgot how to put them on. When I put my CD in it goes to Roxio Creater Basic v9, and when I put it in the Audio CD (D:) doesn't pop up. Can you help me? I imported a cd onto my itunes. It shows up in my library and even shows up when I click on "music" under my ipod icon. However when I sync my ipod the songs won't go through onto my ipod. They are checked so that isn't the problem. Do you think you could help me? I tried copying and pasting but they are listed there so I don't know what to do. I copied music from several cd's into my computer (Itunes) but I am having trouble transferring the music into my ipod. When I attempt to sync I get a warning that existing music will be gone from my ipod. I don't want to lose the songs I've already put into my ipod. Hey Ricky I have a quick question I have a ipod classic and I just added some songs from my CD to my itunes library but it says 2 albums instead of one how can I fix this problem? this is more of a troubleshooting question. I have put tons of cd's into my ipod. But this one specific cd, that I already imported into my library, won't go into my ipod. I drag the tracks onto my ipod but no synchronizing happens. What can I do? I had the same issue and found that I could drag and drop from the "recently added" section under playlists (at the bottom of the page). I did click the eject button next to the cd name under devices as well but not sure if that had any impact. i need help.i put in a cd and it wont import to my libary on itunes therefore i cant put it on my ipod what should i do? Hi, i was just wondering, does this method work for the iPhone? i have the music imported with checkmarks and everything, but when i drag it to the library or my playlist, it is not there! it doesn't show up. what should i do? um im having 3 problems. first, when i got on i connected my ipod and started itunes. a popup came up saying "scan and fix" so i clicked that. it said it was fine. on the screen of the ipod it says connected. itunes didnt show it though. then, i put in a CD and it gave me two options: "play with windows media player" and "open folder to view files". so i waited a while. then, i went to the folder of my ipod on my computer, and clicked open ipod w/ itunes or something. so i waited, and noticed itunes had closed itself out! so i have clicked it multiple times, right clicked selecting "open" too, and NOTHING is happening! At all! I took the cd out, put it back in, and the same popup came up. what do i do? my problem is that i imported my cd, it finished. I highlighted all the songs and dragged them to my iPod but its not transfering. I even did the copy and paste thing but that doesnt work either. the funny part is that when i try other songs, they transfer but not the songs on the cd. i even tried doing it one by one but it doesnt go. whats wrong? I made a homemade CD from our laptop and i want to sync it to my new ipod on a desktop. I have done all the steps, so i hightlighted all of them but when i drag it to the Music library it does not show up!! Help! Heyyyy. I just got the iPod Touch for Christmas. I have some CDs that i want to put on my ipod, but they're in MP3 format. And when i tried to put them in my itunes library and sync them to my ipod, it didn't work. Is there any way that i can put mp3 format songs onto my ipod?? Please help me, thankk youu! Thank's. You were helpful. I've been trying to get musci on my Ipone for 5 months now and then I found your web page! THANKS! heyy i've got a problem when I insert my CD my computer can't seem to read it AND it's not there on the left side of Itunes either! When i put the CD into the computer nothing happens. It doesnt even ask if i want to do anything with it. This is soo stupid!!!!!!!!! I was able to download music from CDs to my Ipod, but under playlists on my Ipod it just has tracks. How do I get the artist and name of the song to be listed? thanks so much for your help ive been trying to put the songs from my cd on my ipod all day and it wouldnt work. THANKS AGAIN SO MUCH! Hi, I downloaded iTunes and I ripped a cd. How do I transfer the music onto my iPod?